Very soon a new kind of memory chip which stores information by melting and freezing tiny crystals technology is to be implemented in Mobile phones, expected an uprise soon. 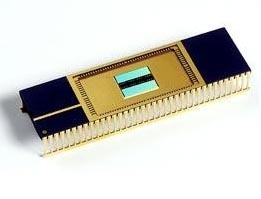 Samsung electronics have announced that it has begun mass production of a new kind of memory chip called the phase-change memory (PCM), the technology which would change the mobile phones expectation by the scientist, it was actually an idea of a scientist in 1960’s but it took all the way to reach the development for the implementation. Phase Change Memory PCM rests on a simple concept- atoms that are neatly arranged in crystals conduct electrons better than those jumbled up in a glass. Unlike conventional memory, which involves moving electrons around a chip, PCM data would literally be frozen in place, even when the machine is off, which means these devices could switch on nearly instantaneously. Scientists developed new classes of crystalline materials in the 1970s and 1980s, in which the atoms were held together via very weak bonds and thus the materials could shift from crystal to glass very quickly. But turning that breakthrough into a working device was not easy and thus other kinds of transistor-based memory, such as the flash memory currently installed in most mobile phones and mp3 players, were closer to the market. There are also statement that though it is a simple principle but much harder to implement, the main problem is with writing the information into the material-to write in a one or a zero, the crystalline material has to be heated to high temperatures and refrozen, either in a crystal or glassy form. Reasoning, that at transistor sizes of a few tens of nanometres, a quantum mechanical phenomenon called ‘tunnelling’ begins to come into play, which allows electrons to leak out of the transistor, effectively destroying the memory. Because PCM memory doesn’t rely on charge, it can theoretically be used to create ever-smaller devices, the speed of PCM memory depends on how long it takes to melt and refreeze the crystal, the smaller each crystal cell in the device, the faster it becomes. A group has recently conducted experiments with cells just 20 nanometres across, which can be switched in just 16 nanoseconds - far faster than existing technology.